Following the huge success of the KATIN WEBER TRIO, singer and composer Katrin Weber has explored the intimate possibilities and challenges of THE DUO. This musical journey takes the listener through new arrangements of well known standards from the Great American Songbook of Jazz, on to Brazilian Bossa Nova and the Blues and also some of Katrin’s own compositions. These new versions capture the spirit of the songs in delightful and surprising ways. Weber and Kirberg, both born and raised in Germany, met in Vienna and soon realized this potential for an inspiring and satisfying musical partnership. WEBER sings both German and English lyrics over KIRBERG’s sensitive, supportive and tasteful guitar playing. The German lyrics to the songs were written by the multi-talented playwright and director, Henry Mason, with whom Katrin has enjoyed working with for many years in theater projects. Besides the inventive interpretations of well known jazz standards, the core of the DUO’s new CD is the compositions of KATRIN WEBER. The sad and sullen ballad of a girl left alone in a bar became the title track, “THE GIRL AT THE BAR” A melancholic “Zu Asche” (to ashes) where Katrin’s composing gifts fleshed out a beautiful melodic song to the poem written by Masha Kaleko. “My Desperate Heart”, a wonderfully mellow Bossa Nova, unfolds the story of the grief that comes of a broken heart. This intimate connection of voice and guitar with all its transparencies, gives freedom for improvisation, musical interactions and fresh interpretations, which are important musical aspects for both artists. “THE GIRL AT THE BAR” is without a doubt a document of a successful partnering of two fantastic musicians. 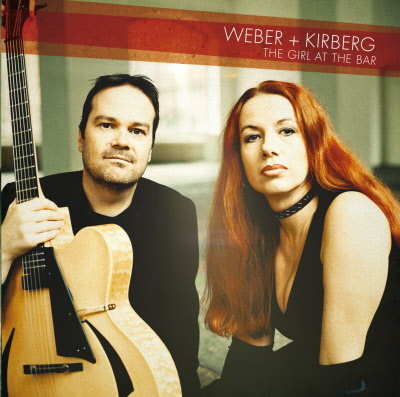 WEBER + KIRBERG master the challenge brilliantly with a CD that guarantees swinging, soulful, touching moments of Jazz.